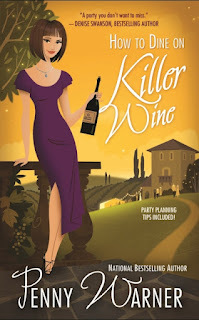 by Presley Parker, party planner from the Party Planning Mystery series by Penny Warner: HOW TO HOST A KILLER PARTY, HOW TO CRASH A KILLER BASH, HOW TO SURVIVE A KILLER SÉANCE, HOW TO PARTY WITH A KILLER VAMPIRE, HOW TO DINE ON KILLER WINE. Presley Parker—in the house! Thanks for the invitation. My RSVP is below. For those party people I’ve not met yet, I’m a party—I mean event planner—who seems to have more party fouls than most. I mean, how often does a dead body turn up at your party? Once? Maybe twice? But after my first party, HOW TO HOST A KILLER PARTY, ended so badly, it’s a wonder I’m still in business. It was supposed to be a surprise wedding for the mayor’s fiancé—but she ended up floating in the San Francisco Bay. As you can imagine, everything went downhill from there. Still, who plans a “surprise” wedding for a woman? That’s just nuts. We girls have been planning our weddings since we were three years old. No wonder the bride-won’t-be ended up dead. There was nothing left to live for. Am I right? So my next party, HOW TO CRASH A KILLER BASH, was held at the prestigious de Young Museum. Who knew an artful killer lurked among the art and artifacts? I probably shouldn’t have planned a Murder Mystery theme, but they’re all the rage and I thought it would make a great fundraiser. I just didn’t count on the person playing the victim to end up with an artifact in her back. I was so excited about HOW TO SURVIVE A KILLER SÉANCE, since it was set at the mysterious Winchester Mystery House. Talk about the perfect place for a murder. But a real murder wasn’t part of my plan. I mean, just searching for a dead body in that 140-room mansion would take hours. But as fate would have it, someone turned up dead right after I brought deceased Sarah Winchester back to life in the séance room. With this kind of luck, I should play the lottery. I thought about giving up the whole business when a friend asked me to host HOW TO PARTY WITH A KILLER VAMPIRE. He’s a movie producer who films on Treasure Island where I live and work, and I just couldn’t say no (he promised me a part in the movie). But I should have turned it down when I found out he wanted the party held in a local cemetery! Talk about atmosphere….Warning: When you add a real dead body to a post-production vampire film, all hell breaks loose. But partying is in my blood (so to speak). I had my first party when I was two. It was a simple affair—just pretend tea, some pretend cookies, with my teddy bear and dolls as guests. By the time I got to college, I had really developed a skill for partying. Unfortunately, the university I was attending asked me to “party elsewhere,” since they didn’t offer a degree in “Partying.” Party poopers. I can only hope my next gig is something nice and quiet. Maybe a simple “Hot Flash Bash” or “Barbie and Ken Go Redneck Party.” I can’t take any more murders. My crime scene cleaner boyfriend is great at getting blood out of the carpet, but I think he’s tired of it. Oh well. Wait until I throw him a surprise party for his birthday. I’m sure he’ll love it. I’m planning a “Hunger Games” party theme, where the guests try to kill each other and be the last survivor. Should be a killer party! Penny has generously offered to give away a copy of one of her books. The winner will be chosen from one of today's commenters. How about giving Presley an idea for a nice and quiet party to plan?????? For us biblophiles out there a local book club party where they come together to discuss their latest book. They have food, maybe wine and cupcakes topped with edible book toppers. Since the surprise wedding party didn't work out, how about a surprise divorce party? That should be subdued and proper. Wakes are always good parties to plan. And since she keeps tripping over corpses, she would always have a job! Wowza... remind me not to go to one of your bashes!! LOL. Planning parties has never been my best thing except for children's birthdays. My granddaughter had a manicure party for her friends with refreshments there and at the coffee shop next door. They loved it! LOVE your comments. Made me laugh out loud. And I got some great ideas! Hope you all win a book! Oh no! A Hunger Games party? I'm ducking already. As curious as I am about such a party, I'm afraid I'm busy that night -- no matter when it is! I love book themed parties, too. Endless options. I'm hoping to have a 'home from the hospital' party in the next few days. Any Presley party sounds fun to me. I love this series. Thank you for the giveaway. Fingers crossed. Love the Home from the Hospital party! Any excuse works for Presley. Location is important and you've covered some of the best.I'm relieved you haven't become a victim. Love the party ideas... especially the Hot Flash Bash. Does it come with chocolate? :-) Looking forward to diving into Presley's newest adventure!